For any government agency, the distribution of available resources among problems or programs is crucially important. Agencies, however, typically lack a self-conscious process for examining priorities, much less an explicit method for defining what priorities should be. Worst Things First? illustrates the controversy that ensues when previously implicit administrative processes are made explicit and subjected to critical examination. It reveals surprising limitations to quantitative risk assessment as an instrument for precise tuning of policy judgments. 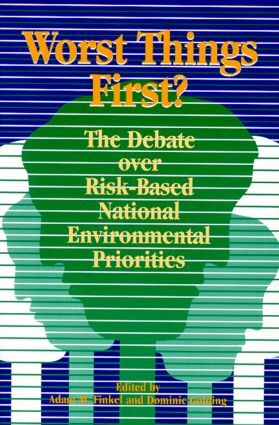 The book also demonstrates the strength of political and social forces opposing the exclusive use of risk assessment in setting environmental priorities. Should We—and Can We—Reduce the Worst Risks First?